Why Can't I Make My Own Engine? This is a common reaction to my questions. I hate that they are right. I really don’t know what I’m doing. I’m a finance guy who learned how to work on cars by reading books. But I’ve learned a lot in the seven years since WRC Mexico and the nay-sayers were wrong about that too. I’m going to do it. I’m going to make my engine. I say “make” my engine because building an engine is entirely different thing. That’s where you take a production block and swap out the rods, pistons, and cams. Maybe you port and polish the heads and raise the compression and play with valve springs. That’s great and all, but I want to make my own engine from scratch. No Betty Crocker cake mix here. I’m not looking to reinvent the wheel. I don’t want something out of a Jason Torchinsky fever dream, a weirdo circular engine of pistons or a variable compression motor, although roller valves look awesome. Check out this single piston, four-cylinder engine with a homemade head. Instead of valves, the tube rotates like a camshaft to expose a little cutout in the tube to the combustion chamber. The center of the tube is hollow so when that slot lines up with the compression chamber as the piston is going down, it draws air though the throttle body on the end of the tube, down the tube, through the slot and into the cylinder. It’s kind of beautiful in its simplicity. The video above used a homemade head on a production block. I want to try the opposite—make my own block and bolt on production heads. I’m OK with a traditional valve train for what I’m trying to do. I want something small, powerful and light. Most production engines are built to withstand a lifetime of a abuse. My engine will likely never see more than 10,000 miles, so why not build one that’s super lightweight? The problem is that it’s too nice. The engines are crazy expensive. I want a 24 Hours of Lemons version. I know this isn’t how the world works, but I think they’re wrong. I think you can build your own engine. Unfortunately, my first engine won’t be a V8. It will be an inline-four to prove it works. Then I can work on the more complicated packaging and machining of the V8. So, how do you build your own block? Well, most people cast them. The others machine them from a solid chunk of metal. These two methods are the right way to build an engine block from scratch. But neither suit my madness. Engine castings are great if you’re making 10,000 blocks; I’ve watched them pour Ferrari engines on Discovery Channel that way. I’m missing a foundry and the ability to make those perfect sand castings. The CNC route is by far the coolest. Learn SolidWorks, the CAD design method. Take a chunk of aluminum and tell the computer to start cutting away metal until you have a engine block left over. You could also manually machine the metal away on an old-school Bridgeport, but I don’t have the patience to learn SolidWorks or run a Bridgeport for a month. I’m going to take shortcuts. I’m going to machine some simple parts and combine them with others until I have an engine block. The key is the cylinders, and I can buy those. I just need a way to keep them in place and parallel to each other. I figured I’ll make a top and bottom plate with holes in them for each cylinder. See, it’s not that hard. The real problem is attaching the crank to the system in a manner that holds it in place. I’ve seen engines flex before and it’s not pretty. Ever watched the video of the team designing their own F1 engine? So that’s going to be a problem, but maybe not, because there’s no way my design is going to make that kind of power. I guess we’ll find out and deal with that issue later. I already know the main flaw in my design, and it is not locking the motor up solid. It’s the way the crank is held in the engine. 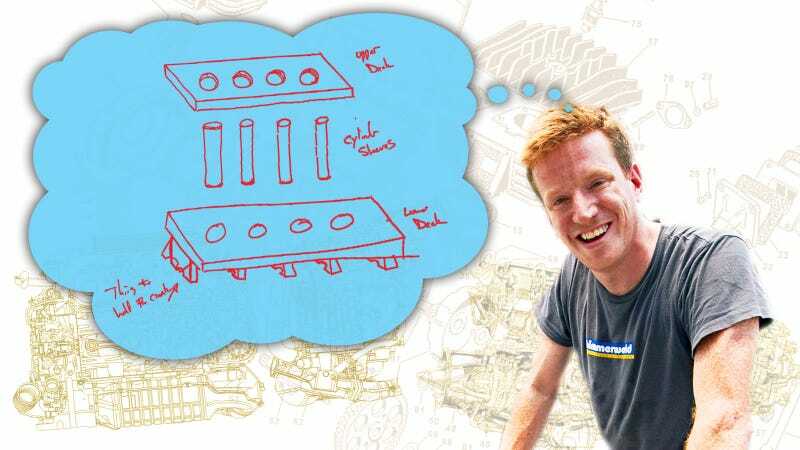 I’m thinking the lower deck plate should have the crank journals machined into the bottom of it like the drawing below. Every production block I’ve taken apart has it hanging there under some caps like that design, but it also has the benefit of being connected to a massive chunk of metal instead of my little deck plate. So, I’m leaning toward something more like the drawing on the right. Every custom racing motor I’ve seen has a girdle-like structure that comes down and secures the crank from the sides and bottom. The structure is either part, of or ties into, the outer structure of the engine similar to the cover picture of the video below. By the way, how cool is this engine? It’s a quarter-scale V8. I have no idea who Kieth7000 is, but he’s my new hero. Look at this thing. Maybe I need to learn Solid Works after all. Now keep in mind everything needs to be built with a ton of tolerance. When all the pieces are done and assembled into a “block,” it needs to go to a machine shop to have the cylinders and crank journals align bored to each other. How do I attach the head to the block? I take the top deck plate with its holes for the cylinder sleeves and add and tap more holes in the same place for the head I want to use. Same deal with the coolant and oil passages. When this part is done, I should have two rectangular plates connected together by the cylinder tubes. The top plate will have extra holes in it leaking oil and coolant from the head down to the block. I can connect metal tubes between the deck plates to pass the oil down to the crank or I can simply pull the oil out of the head and crank with a dry sump set up. I can do the same thing with the cooling by just running the head and block as two separate systems. It does put a bunch of plumbing on the outside of the engine and adds some failure points, but the block is going to be complicated enough as it is. The more components I can pull from the block and house externally, the better. Instead, I’ll run an external oil pump that will pull oil from the crank case and head separately. I can also run different outputs and feed different oil pressures to different parts of the engine. I would love to squirt some oil at the bottom of the pistons. I don’t think I’ll need it, but I really like the concept. A long time ago, I ordered an S14 block from BMW with some of those piston sprayer jets machined into it, but the kid in the parts room stole the block. It was the very last 2.5-liter block from Germany, too. Ever since then, I’ve wanted those stupid piston squirters. The problem is a bunch of Germans went to engineering school and worked out all the fluid dynamics stuff to get the right oil pressure at the right parts of the engine. I think I need to run them all separately with their own pressure regulators. Now, for the coolant. It needs to go down into the area between the two plates and surround the pistons, so I need to box of the sides of my block to hold the coolant. My hunch is that this outer box is going to provide a lot of the engine’s strength. The coolant area won’t see more than 50 psi so it doesn’t need to be pressure proof. It just needs to spread the crank’s load through out the engine so something that looks more like the ladder work on a bridge would be ideal. Then, I could even support the upper and lower deck plates with them and then shroud the area in metal to hold the coolant. How does this all go together? Well, the top deck plate that the head bolts to will be machined so the upper lip of the cylinder sleeve presses right into the deck plate. The bottom plate will slide over the the bottom of the sleeves. Then I assume I need to weld it all together. Before we go any further, I know your first objection. There is no way to weld the assembly together and keep the tolerances. I have no intention of keeping everything perfectly aligned. My goal is to make it close enough that I can have a machine shop true it all up when I’m done. So, while I don’t know what I’m doing, maybe the guys at a machine shop can square my mess up when I’m done. The good news is that I can study 50 years worth of engine design, and the internet is a pretty cool place. Even the forums, sometimes. More importantly, I have some awesome friends who can design and build anything like Rob Masek. He builds three-story combat robots controlled by on-board human pilots like you see in the movies. I also have friends like Strategic Racing Designs, who love to take an idea and turn it into a tangible metal reality—they helped me build the Baja Pig, and they have a CNC machine in their shop. 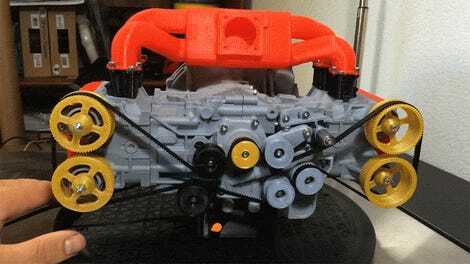 And for all the haters out there, check out this engine made from scratch with no machine tools. It’s very different than what I’m trying to do, but the principals are the same. Intake, compression, power, exhaust. Now, that engine barely charges the builder’s cell phone, but on the other side of the spectrum are these two giant engines. Aardema built this 1,193-cubic inch V12 for hydroplane racing, which is, I think, a 19.5-liter engine, if my math is correct. I met these guys at PRI a few years ago and it got me thinking that I should build my own engine. Of course, theirs is a work of art and makes 3,000 horsepower. The other engine is made by Falconer and was originally designed for three-fourths scale P-51 Mustangs that were eventually never built. But Falconer continued with the engine anyway because it’s so cool. The Falconer is also a V-12 but there’s no discussion of power on their website. One thing I know for sure, if I find a way to build this engine, I’m machining my last name into the valve covers. Bill Caswell is a man of many talents. He occasionally contributes to Jalopnik. Experience The Amazing View From Inside My Engine Bay! How Much Engine Chrome Is Too Much?